Are you tired of substandard offers and bland networks that just ain't choice? Get the real blue stuff. Here at Signup or Login to view earning guides for mobile apps and websites. the finest offers are brought together with love and care, then slow cooked and optimized to perfection. Yes, the old ways are still best at Los Pollos Hermanos. But don't take our word for it. One test, and you'll know. Starting my new website! Will test your system. Sounds very easy. And save my time I hope. I registered on this site. They say they will contact me in 24 hours. I hope I will earn some money. I just registered to LosPollos.com and also sent you a request on Skype. (11-16-2016, 05:06 AM)anhdung113 Wrote: Signup or Login to view earning guides for mobile apps and websites. We hope to share and learn more from you guys. We haven't been able to contact you via skype that you wrote bcs it does not exist unfortunatly. Maybe you just misspelled. Isn't that the dude from Breaking Bad?? (11-16-2016, 08:19 AM)Asmodeus Wrote: Signup or Login to view earning guides for mobile apps and websites. Isn't that the dude from Breaking Bad?? Hi, please look our TOP20 countries by eCPM, from Greece it is possible to earn less than $1 per lead. by filling out this Signup or Login to view earning guides for mobile apps and websites. or by sending us an Signup or Login to view earning guides for mobile apps and websites. 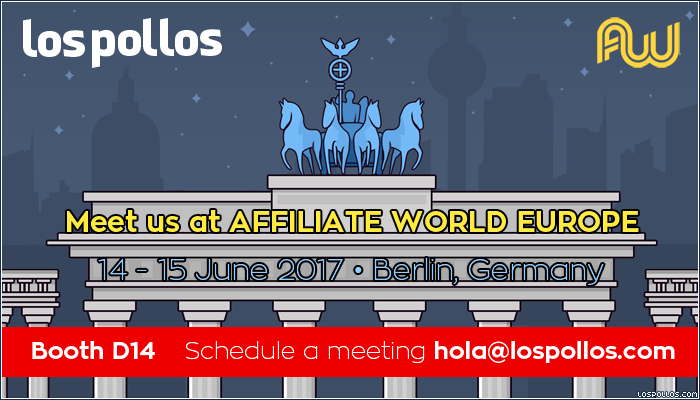 Let us know a convenient time for you to meet, and we’ll see you in Berlin!